Since its introduction, the LCG format has come to be immensely successful for Fantasy Flight Games, and sales continue their growth rate in both domestic and international markets. Fans around the world have enjoyed augmenting their LCG core sets with our fixed sixty-card monthly packs, and have experienced the strategy of deck building without the financial strain of random card packs. But how does this innovative format work? What can you expect from a Living Card Game? A Core Set provides everything you need for a complete and self-contained game experience, but if you choose to go beyond the Core Set, monthly expansion packs provide fresh content at an easily affordable price. These monthly releases offer enough new content to keep the game immersive and strategic, while remaining accessible and digestible to casual players. Monthly expansions provide more frequent additions to your card pool, raising the potential of new deck types and strategies you can explore with every release. These monthly installments ensure that the game is continuously updated and always feels fresh. LCGs have no rare or promo cards that need to be chased. This ensures that games are determined by a player’s deckbuilding skills and play strategies, rather than who spent the most money in pursuit of hard-to-find ultra-rare cards. The fixed format means that every player has equal access to every card needed to build his deck. The non-random format makes it simple to play multiple LCGs without breaking the bank, dramatically increasing your chances of finding opponents that play the same game you do. As each Core Set provides enough cards for at least two players, friends can begin playing right away. Organized Play programs are available for many of our LCGs. These programs include everything from casual year-round leagues to premiere level tournaments featuring regional, national, and world championship level events. Our current catalog of Living Card Games features a variety of themes and play styles. Whether you want to experience the intrigue and excitement of George R.R. Martin’s vibrant setting of Westeros, experience the high-stakes cyberstruggles of a dystopian future, join the fight against an ancient evil in the 1920s, build a fellowship to save Middle-earth from the threat of Sauron, or battle for the fate of the Star Wars™ galaxy, Living Card Games deliver the experience you’re looking for. Across the Seven Kingdoms, the Great Houses of Westeros struggle to control the Iron Throne. You take command of one of eight factions—House Baratheon, House Greyjoy, House Lannister, House Tyrell, House Martell, House Stark, House Targaryen, or the Night's Watch. Based on George R.R. 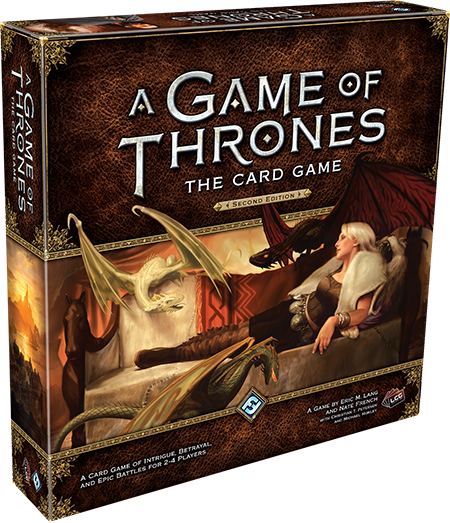 Martin's bestselling fantasy epic A Song of Ice and Fire, A Game of Thrones: The Card Game is playable by two to six players and brings the beloved characters, locations, and events of the world of Westeros to life through innovative game mechanics and highly strategic game play. The game is now in its second edition, featuring streamlined gameplay that remains true to the original spirit and mechanics of the game. Ancient, nameless horrors dwell in the darkness, writhing in the night sky, under the earth, and in our very dreams. Every noise in the night, each barely-remembered nightmare, every chill that runs up your spine, could be announcing one of these malevolent forces. Madness and terror abound; dare you risk your sanity? Based on the fiction of H.P. 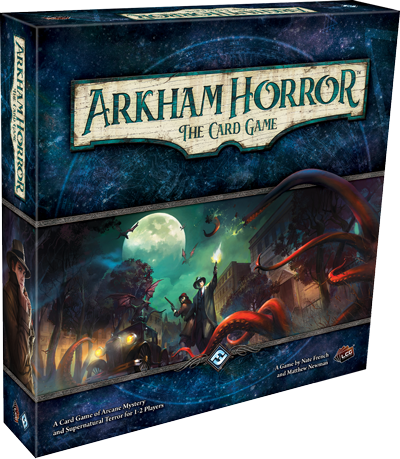 Lovecraft and his literary circle, Call of Cthulhu: The Card Game takes two players deep into the Cthulhu Mythos where investigators clash with the Ancient Ones and Elder Gods for the fate of the world. 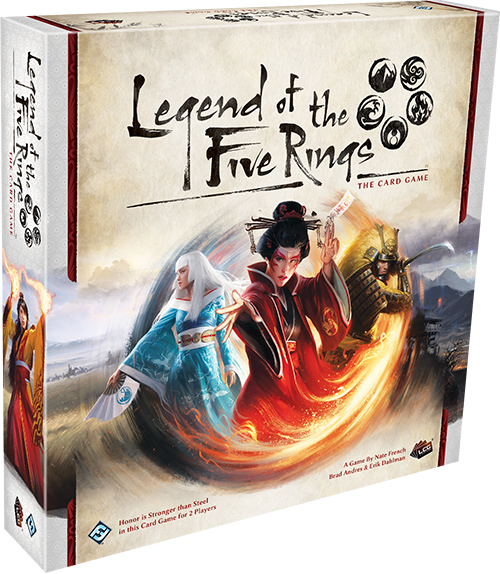 Enter the vibrant world of Rokugan with Legend of the Five Rings: The Card Game, a Living Card Game® of honor and conflict for two players! Now reimagined with new mechanics, story, and the Living Card Game distribution model, you are invited to join the Great Clans and fulfill your duty to the Emperor in a world shaped by a dynamic, player-influenced story. During the game, you take on the leadership of one of the Great Clans which define Rokugani society, and you are cast into conflict against another clan. Your conflicts will decide the future of Rokugan, whether you’re battling with a katana or with cutting words, but the samurai of your clan cannot remain by your side indefinitely—when their destinies are fulfilled, you must find new allies to continue your conflicts. The power of Shadow threatens to engulf Middle-earth, enslaving the Free Peoples to the Dark Lord's will. A glimmer of hope lies with those willing to stand stalwart against the influence of Sauron. However, it will take the combined might of many to stand against the Dark Lord's legions, and time is growing short. Set upon the rich backdrop of J.R.R. 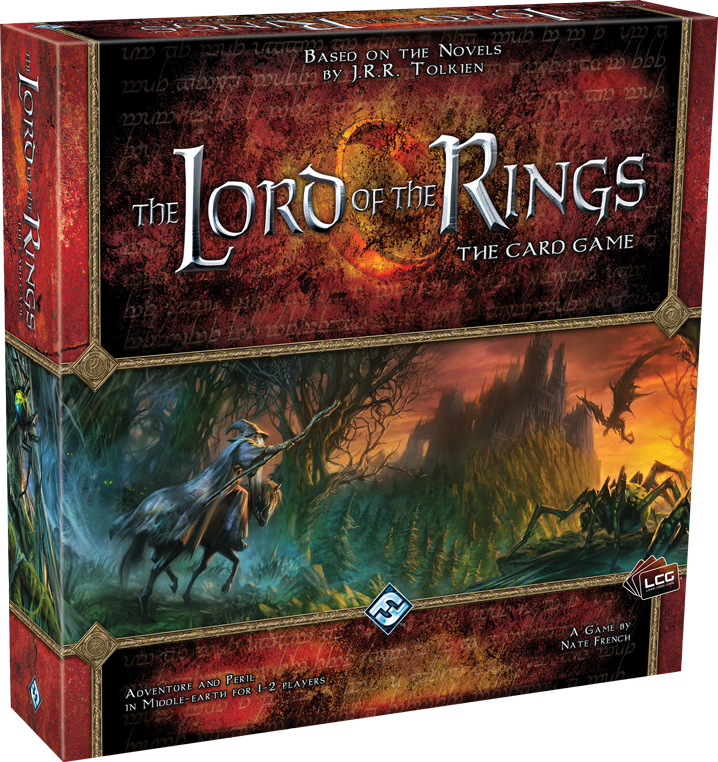 Tolkien's renowned fantasy world of Middle-earth, The Lord of the Rings: The Card Game is the first cooperative LCG. Designed for one to two players (or four players when combining two Core Sets), The Lord of the Rings puts players in control of a customized party of heroes armed with a variety of allies, attachments, and events from four different spheres of influence. Players combine their efforts to face off against different scenarios that are all run by the game itself. The characters, starships, and situations of the original Star Wars trilogy come to life in Star Wars™: The Card Game, a head-to-head Living Card Game of tactical combat and strategic planning that allows two players to wage cinematic combats between the light and dark sides of the Force. Check out our detailed descriptions of each of the above titles, then get ready to experience a new direction in card games!